I never tire of floral prints throughout the entire year. I love any kind of girly detail and this outfit symbolizes just that. I'm carrying my new purse with the bow detail and this LC Lauren Conrad dress from two years ago. Shopping my own closet lets me re-wear some of my old favorites with new accessories such as the purse, jewelry, or shoes. 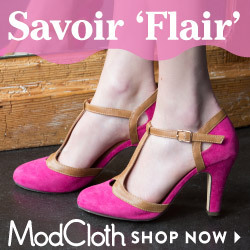 Speaking of, the shoes, from Modcloth, have a very retro feel to them with their velvet texture and cute little kitten heel. I shot these photos up at Cinemark theaters before Justin and I saw a movie. The gorgeous weather and beautiful sunset, along with the colorful leaves, gave such a lovely glow that made it feel amazing to be alive. There was a pleasant little breeze as well that lent a nice movement to my hair and dress. I had to get a photo of Justin and I with the pretty leaves behind us. Let's also take a look at his outfit, which I think is a nice date night outfit for any casual guy. Dark denim jeans, a button down, and brown shoes. Simple and well put together.